Here’s to screen time you don’t have to limit. Not quite in and not quite out, these picture-perfect porches let us breathe in the fresh air and make the most out of the shoulder season. They bring us closer to the great outdoors yet shelter us from the elements. Here are some of our favorite designs—where we’d happily spend time as the weather grows warmer. No cold shoulder here, this restful indoor-outdoor living area by C.M. Ragusa Builders has an undeniably cozy bearing, with its massive hearth, comfy wicker and oversized rug underfoot. 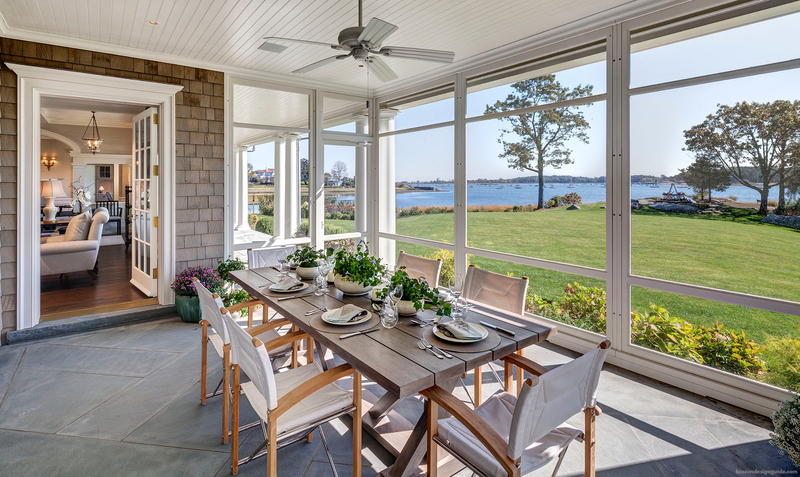 This screened porch on Martha’s Vineyard, designed by Patrick Ahearn Architect and constructed by Colonial Reproductions, Inc. is, at heart, an alfresco family room. It boasts all of the amenities—a plush sofa and chaises, gas fireplace and large-screen TV, not to mention wraparound views. 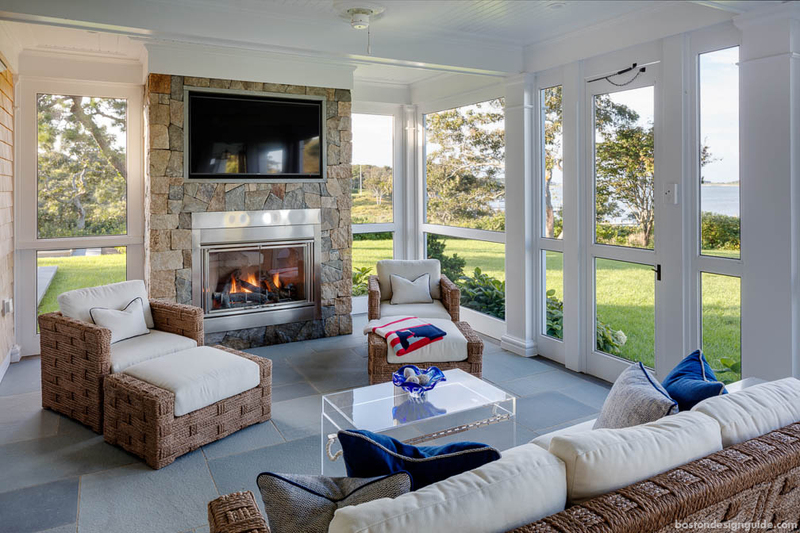 Martha’s Vineyard Interior Design has fashioned an extraordinary great room in the great outdoors. This fully furnished outdoor structure has retractable doors that open to invite in the grounds and terrace. 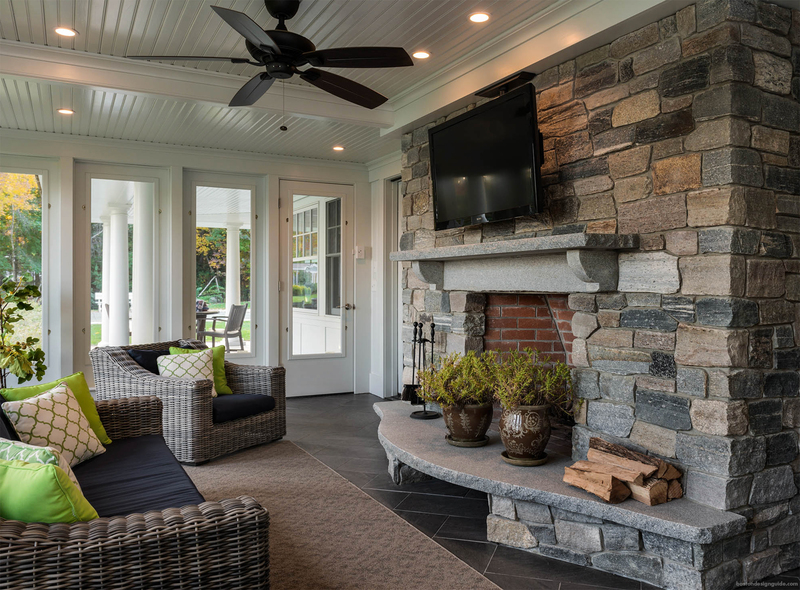 While Sanford Custom Builders’ striking living space sits closer to home, it still has a profound connection to the landscape. 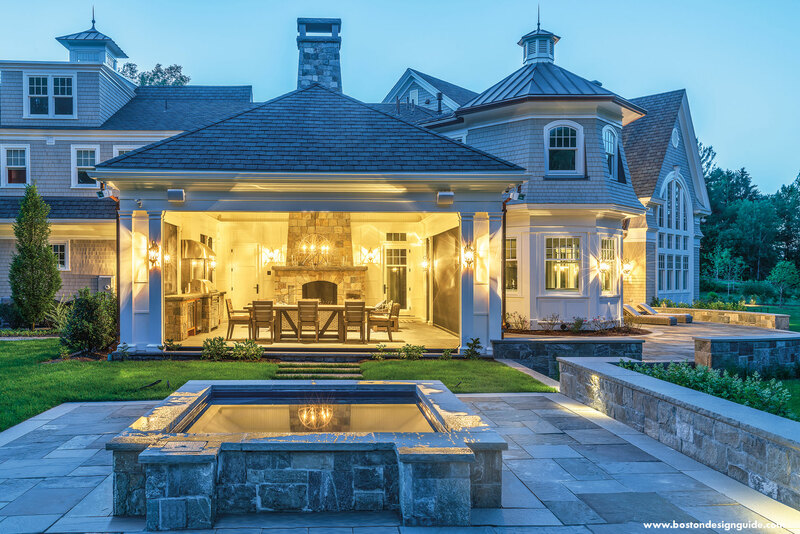 Like a traditional screened porch, it’s accessible from the main home, yet the design, with its pervasive stonework, is most certainly aligned with the surrounding terraces and spa. LDa Architecture & Interiors, on the other hand, adopts a more classic model for its screened porch design. There is little doubt that this is one of the favorite rooms of the house, with its peek-through fireplace and doors that swing wide to the backyard. Charles Hilton Architects’ gracious waterside porch is both functional and divine. Just off the veranda and only steps into the main home, this space for most seasons allows its owners to indulge in scenic views as they dine. 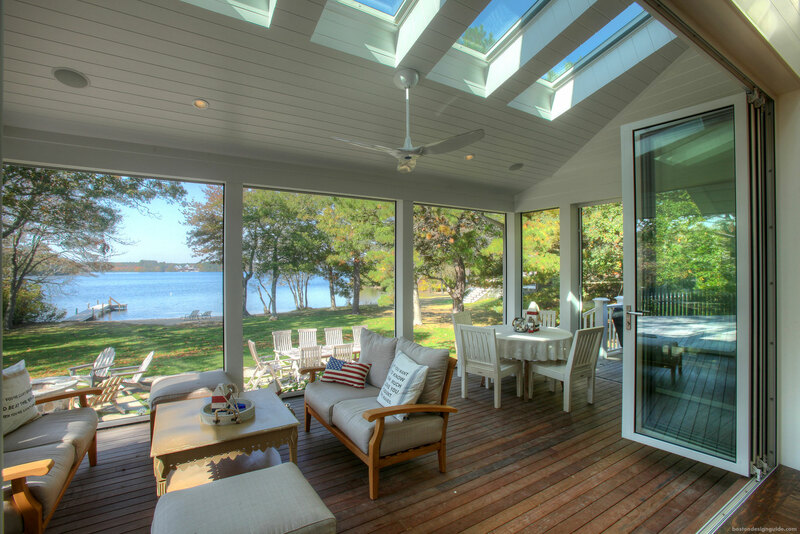 This lakeside screened porch by Architectural Design, Inc. has a healthy dose of nostalgia and a fresh outlook. The sunlit, crowd-pleasing space was made for leisurely conversations, not to mention entertaining, with its connection to the dining room and the outdoor patios. 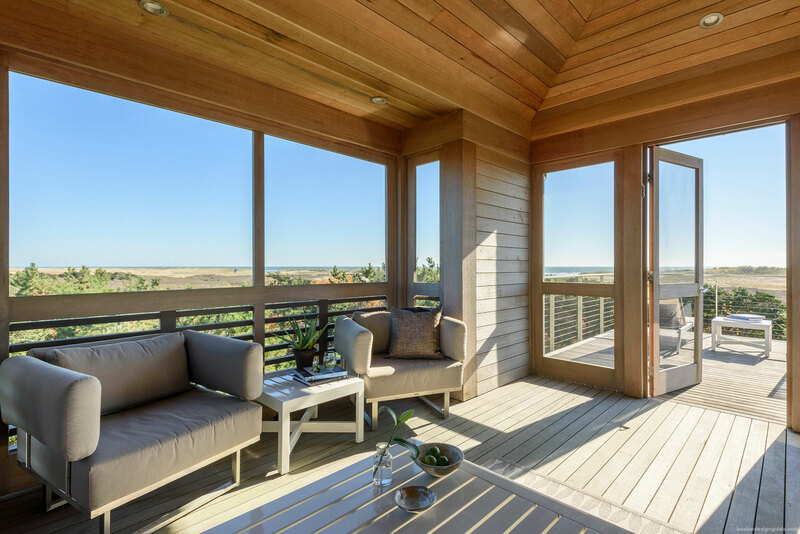 KVH Construction’s seaside porch is airy and restful, and serves as architectural segue from the home to a deck amid the dunes. Here, homeowners inhale the salt air and have it made in the shade without giving up stunning coastal vistas.